Properties in Ashburton average 4.7 out of 5 stars. Meg's Place - Free Wifi Sky TV warm and quiet. Property 5: Meg's Place - Free Wifi Sky TV warm and quiet. 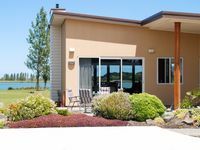 Warm and peaceful with unobstructed lake views. Property 6: Warm and peaceful with unobstructed lake views. Lovely waterfront home, very relaxing and peaceful, only negative is storage - we stayed 8 nights and arrived to a nearly full pantry/fridge freezer and bedroom drawers/bathroom so we struggled with storage a fair bit. Would recommend Bev buy a garage fridge and store her personal items when people are staying a week plus, but other than this would recommend. 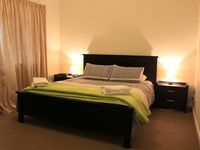 Great, easy and clean and tidy place, with very friendly helpful owners. Close to some shops and the domain, perfect for families.